Crow Canyon Software, a specialist in providing business applications on Microsoft SharePoint and Office 365 platforms, announces a partnership with Iowa-based Spindustry, an IT consulting company known for its SharePoint implementation and training capabilities. 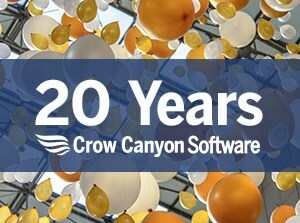 Crow Canyon Software delivers out-of-the-box business applications for SharePoint and Office 365, as well as its unique NITRO Studio™ development platform. Crow Canyon’s business solutions include IT Help Desk, Asset Management, Customer Service, Employee Request Portal, and more. Its NITRO Studio makes it easy for power users to easily create applications of all types for Office 365. Spindustry has been providing IT Services throughout the United States and Canada since 1996. A large part of its practice is in the SharePoint and Office 365 space. By partnering with Crow Canyon, Spindustry will be able to deliver robust business solutions on these platforms to its clients. In addition, NITRO Studio™ gives Spindustry a new tool to do rapid custom development. Spindustry also offers an extensive range of SharePoint training classes, both on-site and remote, and these will available to Crow Canyon customers. Since 1996, Spindustry, based in Clive, IA, has been delivering on the promise of exceptional information management that generates leads, builds connections and drives sales. Their team of professional strategists, designers, developers, analysts and account directors understands how to really achieve their clients’ goals the right way, the first time and on budget.